Google just posted the video from my "Authors@Google" talk last month. It focuses on (what else?) Hollywood's love-hate relationship with new technologies. It was fun to give it at Google, of course, since they're in the midst of being sued by Viacom over copyright infringement on YouTube... one of the biggest media vs. tech cases since the Betamax. Thanks to Kim Weisberg and Ross Peter Nelson for hosting me and treating me to lunch in one of the Google-terias! Analyst Edward Woo with Wedbush Morgan Securities in Los Angeles said the set-top box device sounded ambitious, but wondered how consumers under pressure from the current economic downturn would receive it. “Until I hear more concrete information, I'm not sure how receptive consumers will be and whether it will be different or better than other boxes out there or planned be out there,” Woo said. Blockbuster downplayed posting a third-quarter (ended Oct. 5) net loss of $17.8 million and 2.7% decline ($33.6 million) in total revenue to $1.2 billion, citing a limited slate of movie titles and competition from Olympic telecasts. Update: Venture capitalist Bijan Sabet thinks what we need is an open set-top box that will let anybody deliver content to it and build applications for it. I'm giving my final two presentations about Inventing the Movies for the year. The first is this Wednesday at the Museum of Science in Boston, at 7 PM; the second is December 10th at the Portsmouth Public Library in New Hampshire, at 5:30 PM. Both are free -- and if you're in the area (or have friends who are), perhaps you'll attend. - Challenges your knowledge of movie trivia. 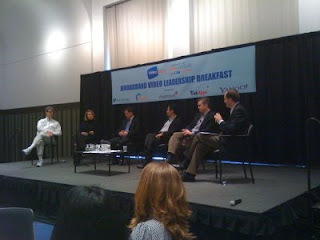 Will Richmond, editor of VideoNuze, was kind enough to invite me to a breakfast panel he organized today, as part of the CTAM Summit, a conference for the cable and telecom industries. Despite the fact that it was held at 7:30 AM on a Monday morning, there was a great turnout. - Roy Price, who runs digital video at Amazon, asked of traditional media producers: if you're too cautious about keeping content off the Web, are you creating an opportunity for someone else [other content creators] to be there? - Peter Stern of Time Warner Cable said, "If consumers can get the content they want, when they want it, they will opt for the highest-resolution screen available to them at the time." That seems true, but often these days they're watching low-res Web video on their laptops because Time Warner Cable doesn't actually give them access to any content they want, when they want it. - Fred Seibert of nextnewnetworks said that all of the new format possibilities available to content creators can be confusing. 'There's some real comfort in knowing that you need to make a show that's 30 minutes long or 60 minutes long, or a movie that's two hours long." But those formats won't necessarily be the most appealing to Web viewers. "Shorter has turned out to be better, and shorter creates certain disciplines," he said, adding that it's still possible to create short content that is simply short and bad... not short and good. - Deanna Brown of Scripps Networks said that "all of the activity around video is really exciting and important to explore," like commenting, reviewing, annotating, and sharing it. Brown mentioned that an online community called 'Rate My Space' (it's like "hot or not" for interior design, with users posting pictures of rooms in their homes) had developed quite quickly into a TV show for HGTV. - David Eun of Google talked about the "head" and the "tail" of Chris Anderson's "long tail" model. He said that in between the two (basically, between big hits and narrowly-focused content that appeals to a tiny audience), there's a "torso": high-quality specialty niche programming. "That's what drove cable TV," Eun said, "and that will be a sweet spot for Internet video." - Eun urged the audience to try not to define what "good" is. Viewers don't care what professional programmers and cable execs think is good; sometimes they're happy to watch dogs on skateboards. Thinking narrowly about what "good" programming is can be limiting. - Moderator Will Richmond asked his panelists what their 2009 priorities are. Eun said "monetization," since YouTube hasn't figured out how to turn a profit on all those videos it delivers. Roy Price of Amazon said that it's continued growth in video selection, continued integration with the expanding universe of connected TVs and devices, and exploring new business models. - Richmond made a great point, I think quoting someone else: "In the past, scarcity [making content available only in one place] bred value... but in the present and the future, scarcity breeds piracy." - After the panel, I had a chance to sit down for a chat with Fred Seibert, which I've posted as a podcast. I had a chance this morning to chat with noted smart guy Fred Seibert. Fred has been a key creative force at Nickelodeon, MTV, and Hanna Barbera, and he now runs nextnewnetworks and Frederator, both of which focus on creating and distributing content for the digital realm, and building communities around it. - Opportunities for new formats and approaches to making content. People creating content for the Web today may only be earning "digital pennies," Fred told me. But just as the music and movie and TV businesses were tiny at the start, Fred's a big believer that digital dollars are not far off for producers of digital entertainment. Here's the file: MP3 audio, 31 minutes long. This one focused on digital distribution, and the lunch-time discussion included folks like Susi Walsh of the Center for Independent Documentary; David Tamés; Jim Flynn of EZTakes and iArthouse; Chris Renzi of Netfilm; Denise DiIanni of WGBH; Sean Fitzroy; Lyda Kuth of The LEF Foundation; Bonnie Waltch of Filmmakers Collaborative; and Cynthia Close of Documentary Educational Resources. I recorded most of the conversation (aside from the first three or four minutes, when everyone introduced themselves.) It's not a wonderfully-produced podcast, but it may be useful to folks thinking through the digital distribution landscape. We talked about iTunes, EZTakes, Amazon/CreateSpace, the re:frame project, new business models and new formats filmmakers should be exploring, and lots more. It's about an hour-long. The MP3 is here. I'm the first person to start jabbering. The description we were sent before the lunch is below -- though we didn't cover all these topics. "The November 6 Lunchbox Lab discussion will focus on film/video distribution on the internet for independent filmmakers. Navigating through the maze of new media platforms such as VOD, video downloads, cable and broadband models can be daunting for filmmakers considering other forms of distribution besides theatrical and traditional broadcast. New models of distribution are constantly being created or evolving , for example websites such as indplay (http://www.indplay.com/home) connects filmmakers directly with licensors allowing filmmakers to have more control over distribution. Our hope is to engage in exploratory and purposeful conversations including answering these questions: what are these new platforms? how does a filmmaker/distributor navigate these new platforms? Which ones have worked successfully and which ones have not? How are small independent distributors working with these new technologies? Who is making money and how? Are there ways in which this community can do trials to test the efficacy of different methods? Are there opportunities to incubate some projects?" This gathering in Cambridge on November 21 and 22nd looks really cool. Topics for this year's panels include global distribution systems and the challenges of moving content across borders, transmedia, franchising, digital extensions and world building, comics, convergence and commerce, social media and spreadability, as well as renewed discussion about how and why to measure audience value. While I was on my book tour in October, I kept seeing ads on billboards and bus shelters for Disney's release of 'Sleeping Beauty.' (I also read this review in the New York Times.) Disney refers to this as the first of its "animated classics" to be released on Blu-ray. There are two options for those who want to buy 'Sleeping Beauty.' For about $24 on Amazon, you can get a package that includes a Blu-ray DVD and standard-definition DVD. (The Blu-ray disc has some interactive BD Live features, too.) Or for $15, you can get a two-disc standard-definition DVD set. What you cannot do is download 'Sleeping Beauty' on Movielink, CinemaNow, iTunes, Amazon, or any other legal marketplace for digital movies. I happened to have a chance to talk with two execs, one at Disney and one at Pixar, about the situation. - We'll eventually do a digital release of 'Sleeping Beauty' and we'll do another marketing campaign then. - We feel people will be confused by our promotion of Blu-ray and BD Live as a high-quality, interactive, high-pixel-count experience...if they are also presented with the option to buy a lower-quality digital version. - You have to master a movie all over again especially for the download version. Contrast Disney's approach to the one Warner Bros. took with its release of 'Kitt Kittredge' last week. The movie is available on iTunes, Movielink, or Amazon as a $3.99 rental or $14.99 download. (For some reason, the download on Movielink is a bit more expensive.) The $16 standard-def DVD comes with a digital copy for your PC or Windows portable media player, as does the $27 Blu-ray disc. So would someone explain to me how the Disney strategy makes sense? Labels: Amazon, BD Live, Blu-ray, CinemaNow, Disney, DVD, high-definition, iTunes, Kitt Kittredge, Movielink, Sleeping Beauty, Warner Bros.
For me, it started playing relatively quickly, and looked good. But the sound was out of synch. Oh well. Christopher Holland has just published Film Festival Secrets: A Handbook for Independent Filmmakers. It's an incredibly comprehensive roadmap to getting a film accepted by festivals -- and what to do once you're in, like working the crowd, dealing with media relations, and handling post-screening Q&A. I've never seen so much good advice about making the most out of festivals collected in one place. Chris once worked for the Austin Film Festival as a marketing coordinator, and he's now the director of festival operations for B-Side Entertainment. There's a great Web site related to the book, where Chris offers free digital copies. He has also sent me a few paperback copies (retail value: $24.95) to give out to CinemaTech readers. If you're interested in getting your hands on a free copy, just post a comment below about the project you're working on now and the festivals you hope to get into. (Be sure to include your e-mail address.) Mailing costs are on me. Q. You‘ve written a book about innovation in the media arts, and one recent innovation within our new digital world appears to be the decimation of traditional ways in which artists are paid for their work. Do you think there will be a countervailing innovation that will allow artists to get paid again, or, as [Wired Magazine editor] Chris Anderson argues, is all digital media destined to be free? A. Well, I hope that innovation will offer ways for filmmakers to capture lots of value from their work. I‘m pro making money from creative work. I‘m a writer, that‘s what I do. I worry, though, that preserving the idea of being paid cash for the privilege of watching your movie, whether it‘s a download or a DVD, may be under threat. I had a conversation with one of my students. He has never bought a movie on iTunes, he doesn‘t buy a lot of music, and he said, “Your book and Web site are great — I downloaded the three free chapters, but I haven‘t bought the book.” I think that‘s kind of representative of the fact we may be heading towards the Chris Anderson “giving a lot away for free” economy. The challenge is going to be figuring out the new business models. Maybe they are ad-supported or maybe everyone needs a benefactor, a Medici family backing you up. Or maybe it‘s something else we haven‘t discovered yet. Q. It‘s so ironic, because all these new models harken back to the oldest artist-support models there are. The patronage model goes back to the 15th century, and the idea that the artist is a traveling showman dates from before recorded media. A. Yeah, maybe filmmakers will have to make money at live screenings where the audience interacts with them and has a cocktail before the movie and a Q and A after. Maybe it will be a little bit like the road shows of old. I understand, though, that a lot of filmmakers, like Hollywood studios, want to preserve their ability to sell DVDs, which have a great profit margin built into them. But I just know that DVDs are not going to have an infinite lifespan. Physical media is clearly going away. Even Blu-ray DVDs are going to go away at some point.